Akshaya Tritiya day is the very auspicious day - there's no in auspiciousness to be found today so even checking muhurthas is considered unnecessary, so auspicious it is. Whatever one does for devotees, and for Krsna that person will get more benefit and it is eternal benefit and never lost. It is important to hear such a story/pastimes as this so that at least by hearing this, we engage ourselves in the service of Guru, the Vaishnavas and Krsna. Thus becoming inspired to always render service the devotee is always the beneficiary of such interaction with the Vaishnavas, one's Guru and Lord Sri Krishna. On the Pandavas return to Hastinapur they resided in the palace created for them by the demon Maya Danava. Mayasura built this palace out of gratitude to Krsna for saving him in the forest fire in the Khandava Forest where he was hiding when Agni devoured it. He also presented Bhima with a magnificent fighting club. After the Rajasurya sacrifice was performed, Duryodhana, being always envious of the Pandavas, came to the mansion created by Maya Danava's illusions. Bewildered by illusions of many kinds, Duryodhana mistook the solid floor for water and lifted the end of his garment to walk forward on what he thought was shallow water but it was solid floor, and after a few more steps he fell into waist deep water mistaking it for a solid floor. Proud Duryodhana, who was wearing his crown and a costly necklace was very angry, but when he fell into the water everyone laughed, especially Draupadi and Bhima. Yudhisthira tried to check the laughing of all the women in the palace, by raising his hand and his glances. Lord Krsna however, encouraged it by the suggestive gestures of His eyebrows. Humiliated and swearing revenge, Duryodhana turned his face downwards and went back to Hastinapura. The Kurus then made a conspiracy to trick Yudhisthira into a gambling match by which the Kauravas (Kurus) could cheat the Pandavas out of everything with the dice made from Sakuni's bones. 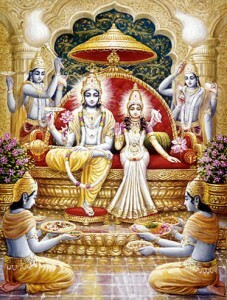 During the match Yudhisthira lost his kingdom, wealth, jewelry, clothing and finally even gambled and lost his wife. When Dussasana went to fetch the chaste Draupadi, she said she couldn't come to the assembly as she was undergoing her monthly period, and was only dressed in one piece of cloth (a simple 'sari'). Draupadi had a beautiful bunch of hair which was sanctified at the ceremonial Rajasurya Yajna, but Dussasana defiled that sacred lady and grabbed her by her hair just to insult her. When he started to pull off her sari just to make her naked, Draupadi, realizing that she had no hope of help from her husbands as they too had been lost, by Yudhisthira being tricked into upholding mundane moralistic codes and now had no free will to act (though Bhima was transcendentally situated from such sentimental codes his brothers tried to make him restrained to follow Yudhisthira's mood and etiquette). Draupadi then cent per cent, completely surrendered to Krsna, and to the amazement of the assembly, as much 'sari' as Dussasana took from her body, as much again replaced it. Lord Krsna, though protecting his surrendered devotee, decided that for their sinful behaviour the Kurus would be inevitably killed at the Battle of Kuruksetra and all of their wives would too loosen their hair in public, but this time as widows. When the Pandavas were exiled to the forest for twelve years after a second gambling match, the Kurus made a clause, that after the completion of twelve years the Pandavas had then to spend one year incognito, thus making thirteen years all told. If, during the final year the Pandavas's whereabouts were discovered, they again had to spend another twelve years in the forest. Because the Pandavas were concerned how to feed the 'brahmanas' who accompanied them to the forest, Srimati Draupadi Devi was given a pot by the sun god called by Aksayapatra. This pot would never be empty until Draupadi had taken her meal and turned the pot upside down. Then it would produce no more for that day. Once Draupadi had finished cooking and had just taken her meal when the Muni Durvasas arrived with many of his disciples. The angry sage Durvasas and his disciples had secretly been asked to go there by the Kauravas who knew that by this time Draupadi would have taken her meal, and if she was unable to offer them anything to eat, she would incur the wrath of Durvasa. Durvasas and his disciples went to the river to bathe and freshen up before taking their meal. Draupadi, full of anxiety, prayed to Lord Krsna to help her. Lord Sri Krsna then told Draupadi that if there was a morsel of food left He would be satisfied if that were offered by Draupadi, His pure devotee with love to Him. Seeing a fragment of spinach stuck to the side of the pot, Krsna asked for it, Draupadi offered it to Krsna, and simply by eating that morsel of foodstuffs, all of Durvasas' men and Durvasa himself became completely full and satisfied, and out of embarrassment slipped away and didn't come to demand a meal from Draupadi as the sinful Duryodhana had arranged for them to do. Sandalwood paste is applied all over the body of Jagannatha leaving only his two eyes visible. 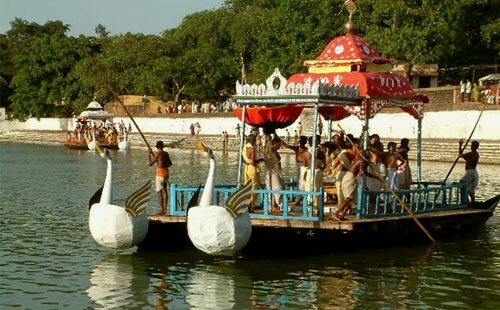 The utsava murtis (functional Deities - Vijay utsav) are taken on procession and are placed in a boat in the temple pond. To commemorate this festival, Lord Caitanya also carried out water sports with his devotees. "In Sri Mayapur Candrodaya Mandir the devotees were observing the charming and beautiful Chandan Yatra festival at ISKCON Sri Mayapur. Every day hundreds of devotees spent some time making sandalwood paste by grinding the wood on a stone grinder. This sandalwood paste is applied to the bodies of Lord Madhava and Narasimhadeva. Jala-dana festival was also going on---dripping water on the Shaligram Sila and Tulasi. In the afternoons the original Deities of Sri Sri Radha Madhava were taken to Srila Prabhupada's Samadhi lake and a beautiful boat festival was observed. The boat was decorated like a silver swan with a temple on it. After the boat pastimes the Sri Sri Radha Madhava were places in a flower house and swung in Jhulan style with devotees chanting and dancing before them. Like this every day of Candan Yatra is a colorful festival filled with life and joy."